The Global Search feature enables end users to search for features. Global Search searches layers and tables that have Global Search enabled. It returns a list of the features with attributes that match the user's search text. Global Search is capable of searching multiple sources, including both map services and geocoding services, if the site has geocoding services configured. If a particular feature is returned by more than one source, it appears more than once in the results list. Duplicates are not removed from the results list. For more information about searching geocoders, see Geocoding Services. 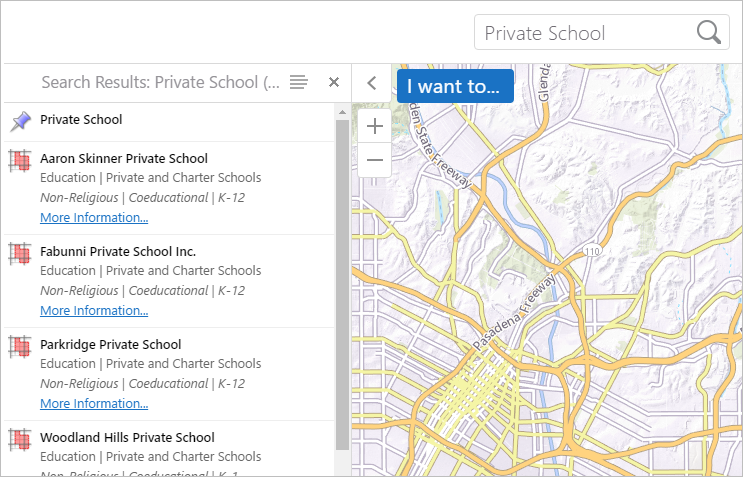 The Global Search box and search results for a search term "Private School"
If you configure one or more search tables, Global Search can also search for non-spatial data that is stored in a relational database. Use the Map Service's Search Feature (Layer Search): Essentials sends a search request directly to the map service that is being searched, or to the map service's search service if it has one (for example, ArcGIS Search). The service performs the search, and then returns the search results to Essentials. This method is called Layer Search. Layer Search is the default method used for Global Search. Maintain an Index to Search (Instant Search): For ArcGIS map services only. Essentials maintains an index of feature data that Global Search searches. This method is called Instant Search. If you enable Instant Search for a particular map service, Essentials uses Instant Search to search that service, instead of Layer Search. If you want to use Instant Search to search a particular map service, you must turn it on for that map service. The results from the different search methods and services are aggregated. The results appear combined as a single results list. The viewer adds results to the list as the results are received. Because Instant Search is so fast compared to Layer Search, the results returned by Instant Search are usually at the top of the list. Layer Search results appear at the bottom of the list as the viewer receives them. In order for end users to be able to search a layer's features, Global Search must be turned on for that layer. You must turn on Global Search for both Layer Search and Instant Search. Global Search is turned off by default because not every layer has relevant search data. You must turn on Global Search for each layer that you want to be searchable. You must then activate Instant Search for each service that you want to use Instant Search rather than Layer Search. When you turn on Global Search for a layer, by default, each field in the layer is searched. You can turn off Global Search for individual fields. If there are some fields that you do not want to be searched, turn off Global Search for those fields. Global Search switches search on for both Layer Search and for Instant Search. If you are using Instant Search, and want to turn off search without disabling and then re-indexing the data, you can use Global Search to turn search on or off. You can use batch editing to enable Global Search for all the layers in a map service or folder. Click the layer's drop-down menu . Select Include in Global Search. In the list of map services, use the Expand icon as needed to show the layers that you want to configure. Click Edit next to the layer. For group layers, you must edit the sublayer, not the group layer. On the Details tab, scroll to the Supported Operations section. Select the Include in Global Search checkbox. In the Excluded Fields column, select each field that you want to include in Global Search. To select multiple fields, hold the Ctrl key down while you select each field. Click the Include button between the two columns. Each field that you moved to the Included Fields column is listed individually and has the Include in Global Search setting turned on . There is an <all other fields> item at the top of the list. Press the Include in Global Search icon beside <all other fields>. The Include in Global Search setting is turned off for the fields that you left in the Excluded Fields column. these fields will not be searched by Global Search.